Here in the Pacific Northwest various odd things happen due to the constant squishiness and rain. It isn’t uncommon to be out in the brush and take a shot that just kind of goes wild and thus makes you ask, “How did I miss?” Well this might actually explain quite a bit. Sierra bullets posted an article on their WordPress site about just this phenomenon. Water in the barrel plays a huge factor in bullet accuracy, it appears. How On Earth Did I Miss That Shot? I’m notorious for saying after an unbelievable miss “I’d sell you that sight picture!” By which I mean that the crosshairs of the scope or the appearance of the sights were such that I would take the same shot again and again and expect perfect bullet impact and yet the dreaded MISS occurred. An example of this scenario occurred a few years ago while my wife and I were antelope hunting in the great state of Wyoming. We have some friends that have a ranch up in the mountains and they allow us the privilege of hunting with them occasionally. This particular trip we had a foot of snowfall overnight. They were really excited as they seldom get the chance to hunt antelope in the snow and we were really excited as we seldom get to hunt antelope period. We spotted a small herd of “goats” and executed a stalk on them and despite having to crawl for about a hundred yards, we got into a shooting position up on a knoll about 150 yards from the herd. I had a doe/fawn tag and after quietly watching the herd for awhile and a whispered discussion as to hopefully picking a doe out that did not have yearlings hanging with her still. A particular antelope was picked out and while the other three peeked over the sagebrush I steadied the gun for a shot on some shooting sticks. I was shooting a recently built 358 Winchester and was shooting Sierra’s 225 gr. Spitzer boattail bullets (#2850). At the crack of the rifle the last thing I saw in the scope was perfect crosshair alignment and the rifle tracking straight back towards me. I expected excitement and high fives after the shot, instead my buddy said “I can’t believe you missed that doe that far!” He watched the bullet hit WAY OVER her back. Now I’m not the best shot in the world, but I KNOW when I shoot a good sight picture and execute follow through. Immediately my mind started churning and the best we could come up with was possibly snow in the barrel. Remember the foot of new snow and the crawl to get into shooting position? 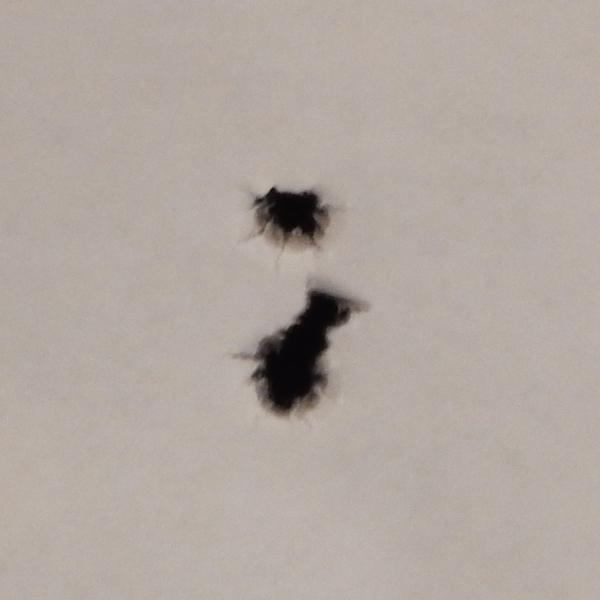 Upon returning to work I thought up a test to verify/or crush the theory that snow/water had gotten into the muzzle of my rifle and caused a wild shot. I did not have anything covering the muzzle and as you know a 35 caliber bore diameter is fairly large and could easily have gotten contaminated. To test my theory, I loaded nine rounds of 308 Winchester ammunition. 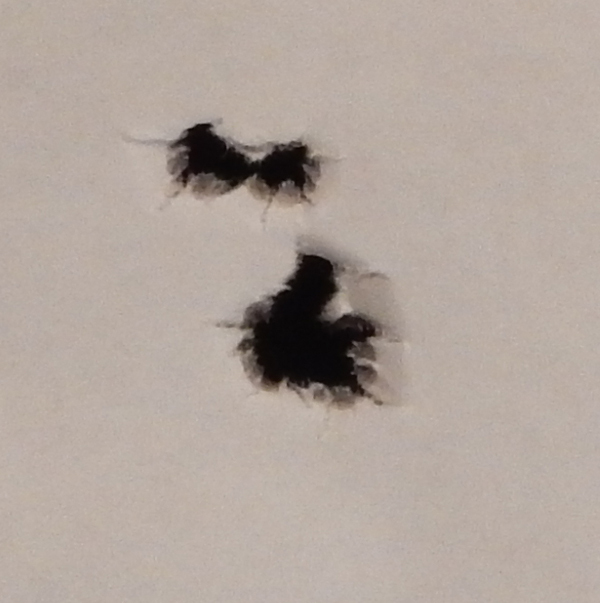 I utilized the 165 grain SBT bullet (#2145) and enough Accurate 2495 powder to shoot well (approximately 38 grains). 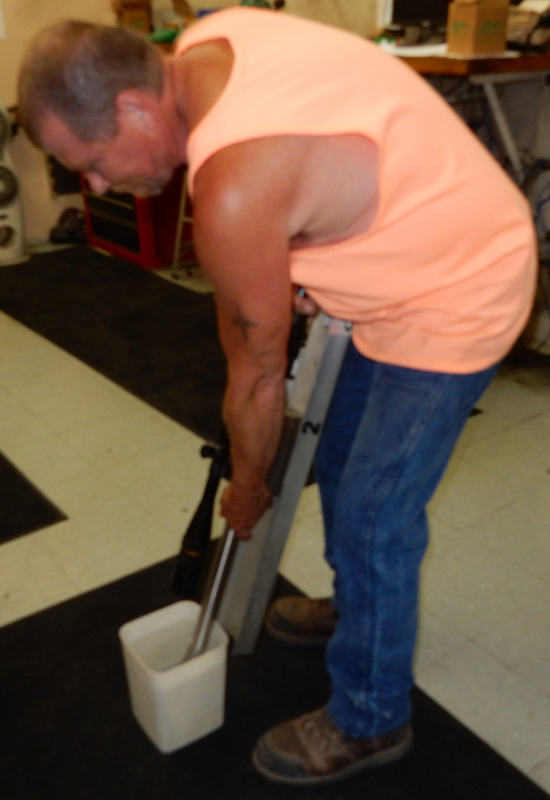 * I then utilized a fouled 308 Winchester barreled action in one of our return-to-battery machine rests for the evaluation. This testing was conducted at 200 yards. I fired three shots and documented the velocity at 2378 fps. I then fired three more shots but before each shot I placed a piece of electricians tape over the muzzle, this would effectively keep any water out of the barrel if placed properly. There was no accuracy or velocity change with the electricians tape in use as you can see. Shooting with the last eight inches or so of bore wet reduced the velocity of this load by 47 fps. As you can see from the target results below, you don’t want any water in your barrel if you intend to hit what you’re aiming at. I believe I found the reason that antelope doe escaped my efforts to transform her into table-fare. *Please note: While this load was safe in the rifle used in this article, it may not be safe in your specific firearm. **If you think there might be any obstruction in your barrel, unload your gun and check. Do not fire any firearm with the barrel obstructed in any way. This actually explains quite a bit about how some shots go wild for no real apparent reason, especially in wet environments. It might be something that I start to mess around with for testing purposes. I have a couple old, beat up Mosin’s that could use some field time and fun with testing. 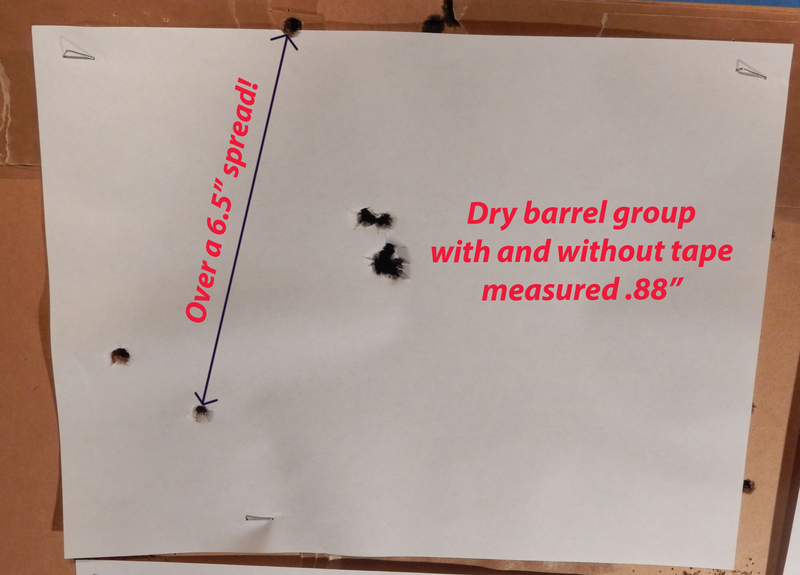 This entry was posted in Classes/Education, Firearms and tagged gun accuracy, missed shot, shot miss, water bullets, water in barrel, wet barrel, wild shot on July 24, 2015 by Woodsbum.